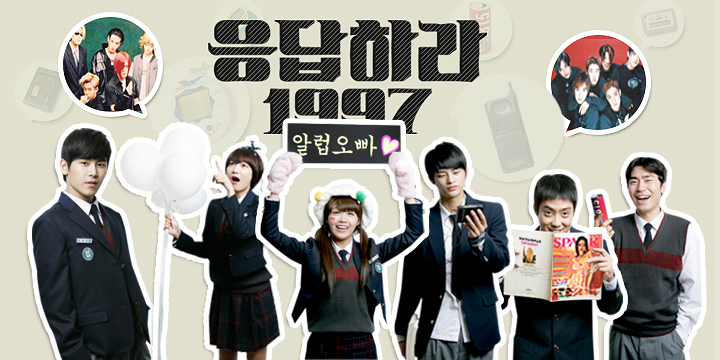 Reply 1997 is a 2012 South Korean TV drama series that centers on the lives of the six best friends in Busan city. This is the Romance, Comedy Teen drama series starring Jun Eun-Ji, Seo In-Guk, Eun Ji-Won, Shin So-Yul, Hoya, Lee Si-Eon. The story mainly evolved to the childhood best friends Shi-Won and Yoon Yoon-Jae in their quirky friendship progressing to a secret Love and turning to a First love that ripened at the right time. Harder and most Intense than most adults. Episode 2: Becoming More And More Different. Go-Stop… You have to get a pair..
Of the same card to earn points. Once, we tried to be a pair too. But one day, we started to change. Why was it so hard to admit it? We had started puberty a long time ago. And I wanted to confirm something. SECRETS become even more secretive. Things I believe to be true aren’t always true. The human mind is infinite. Neither its depth nor its end can be known. Some days, they fight to the death. Other days, they share their love for each other. Yes, the truth is inconvenient. We have to lie with lies. We have to accept inconvenient truths. What we see is not all we know. You can’t stop looking at that person. There is no gain without effort. You can’t get it if you stand still. There is no more FAIR PLAY. I thought falling in love would be special. But it was nothing like I imagined. When you put on lenses instead of your Glasses. My FIRST LOVE suddenly began. It was a bad feeling riding in on a cold atmosphere. It was a sign from God. Life comes and attacks you when you least expect it. It might be sadness, or extreme fear. Accept reality and admit we lost. We don’t know how life will turn out. There is no way we can avoid it. But life sometimes thrills us with unexpected events. And gives us happiness when we overcome hardships. For the people we love is… Give ourselves up. Love makes you do what you wouldn’t do. Your future dream is about what you can do for a living. That’s why you have to be satisfied with the easiest dream. It hurts if you aim for a dream you can’t reach. That’s why unrequited Love is Foolish. It’s painless and it saves time. People have to be satisfied with an attainable dream. Empty passion only leaves you with Heartburn. That passion sometimes causes miracles. And sometimes, dreams come true from a distance. Getting close gives you the chance to be happy. The day I’d feared and avoided. The day I’d been waiting for. The Allied Forces attached the Germans. To prepare for this decisive D-Day, strategies must be perfect. You must know exactly where your enemies are. You must understand your enemies. You must be able to read your enemies’ mind. On D-Day, there is only Victory or Failure. The first D-Day of my life. I had prepared perfectly, but it ended in Failure. Tied around their little finger. The string is tied to a person they are destined to be with. However, it’s hard to finding out who is waiting at the end. The string is as tangled as the number of people tied together. As we untangled it, we get to see our fate. If the red string of fate really exists, where will mine end? The reason I like you? Because it’s you. Just you. I wish I knew. Then I could figure out how to stop liking you. If I can’t avoid it, I only want one thing. To stay by you as a friend, unchanged. A relationship that was easy to explain and easy to maintain. A Casual relationship between old friends. But that day, I realized something. Ours could become one of the hardest. That between a man and a woman. face different sides, and dream different dreams. is of ever-lasting love and fighting. They get upset and console. They hurt and they embrace. A relationship as complicated as manic depressive disorder. It can’t start if the timing is wrong. A relationship that is too complicated and too sensitive. A relationship that’s tedious but inevitable. A relationship that lasts your entire life. Is that any situation can be reversed with one word. It means he never wants to see her again. Being a teenager is a stormy period because we don’t know any answers. We struggle to find the answer. We’ve already become adults and undergo big and small goodbyes. At winter, the world was full of separation and goodbyes. The end of the world would have been a better fate. I hadn’t forgotten everything, but I had put it all aside. Just like that, my body had been holding on to the memories. When I was his mad fan. The 90s had unexpectedly returned. Episode 13: Next Time ?……No..Now!!! She was always upfront her feelings. I could have just said it. I LIKE YOU! BE MINE. Then, as now, I could only hesitate. That next time may never come. lazy there is no Hope for a next time. If you love her, the best time to love is now. Approach her before it’s too late. Your next chance may never come. is not because people we first loved were actually handsome, or pretty. a bit stupid at the time of first love. passionate time of our days. We throw ourselves with passion and finally come to face failure. But it is at the same time dramatic. we never get to experience again. So first love becomes the most dramatic moment of our lives. Tragic stories stays longer than “HAPPILY EVER AFTER”. It’s nice to have that wonderful story as one chapter of one’s life. FIRST LOVE is a period of time. Time has to yield for that new love. Due to the pain suffered with the first love. A person who dreams of love, is the one who waits. Thus, it’s okay to be like this. Even though, there isn’t a tragic drama in my life. But there is a familiarity like an old sweater. And now as a husband and wife. Familiar excitement. I like it.